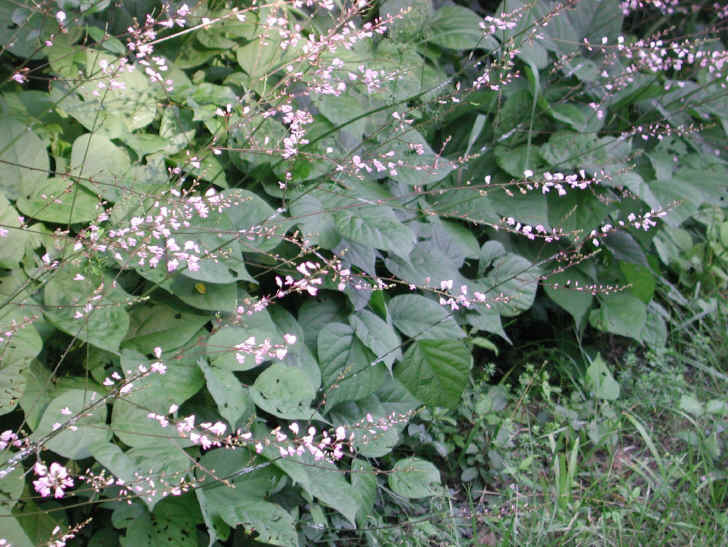 Desmodium glutinosum plants in bloom. Copyright © 1998-2018 The Mary T. and Frank L. Hoffman Family Foundation. all-creatures.org (Accessed 2/2018). 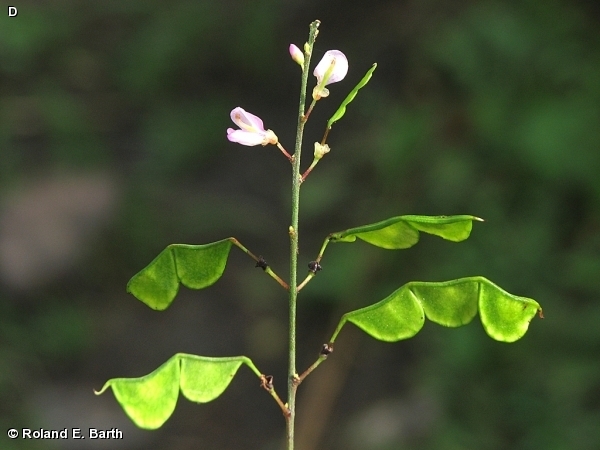 Desmodium glutinosum is a perennial herb, 10-40 cm tall, stems erect, solitary. 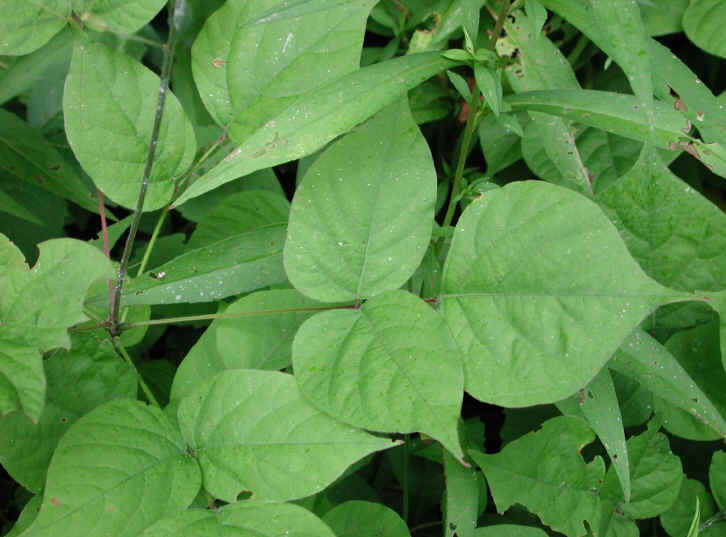 Desmodium glutinosum leaf. Copyright © 1998-2018 The Mary T. and Frank L. Hoffman Family Foundation. all-creatures.org (Accessed 2/2018). Leaves alternate, 3-parted, whorled at base of inflorescence, leaflets asymmetric, terminal leaflet 7-15 cm long, 6-12 cm wide, broadly egg-shaped, tip long-pointed, lateral leaflets narrower, stipules narrow, 0.1-1.0 cm long, persistent. 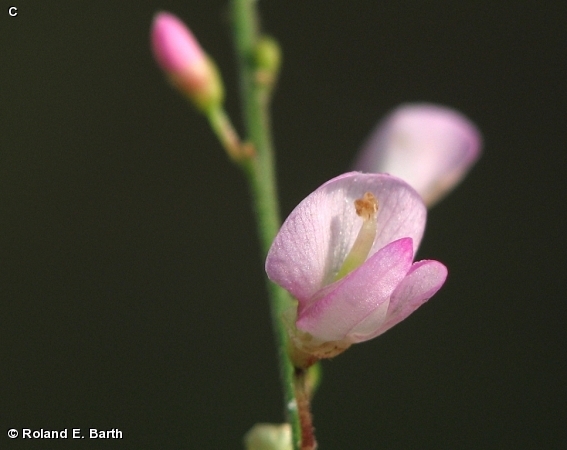 Desmodium glutinosum flower close-up. © Roland E. Barth. Fontenelle Forest. Nature Search. fnanaturesearch.org (Accessed 2/2018). Flowers purple, pea-flower-shaped, to 0.8 cm long, on short, stout stalks; inflorescence terminal on a stalk to 80 cm; blooms July-Aug.
Desmodium glutinosum fruit and flowers. © Roland E. Barth. Fontenelle Forest. fnanaturesearch.org (Accessed 2/018). Fruit dry, with 2-3 segments, jointed between seeds, segments to 1.2 cm long, bluntly triangular, ca 1 cm long, 0.400.7 cm wide, upper side nearly straight, lower margin deeply curved, divided nearly to upper margin. Seeds dispersed by sticking to fur or clothing (Matlack 1994). Habitat: Dry, rich or rocky woods.